“How to show? Lab for Research and Art” – an exhibition series of events, talks and exhibitions showcasing artistic research, at various project spaces in Berlin. From February to April 2014 doctoral candidates from Bauhaus-University Weimar, Helsinki’s Kuvataideakatemia and Aalto University as well as the University of Ulster in Belfast will invite to exhibitions, talks, performances, screening, workshops and more to share forms of artistic research. The How to Show? 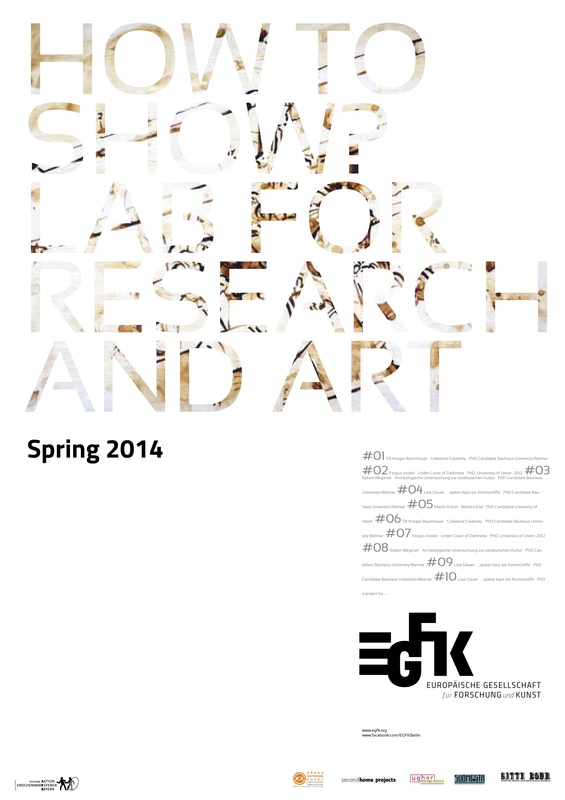 Lab for Research and Art was conceived as a collaborative project of the European Society for Research and Art (EGFK), the Ulster Research Salon (URS), the Kuvataideakatemia (Kuva) and several art project spaces in Berlin. The project is intended to foster the exchange of experience between researchers and institutions and to present artistic research projects to a broader public. It will bring ten doctoral candidates for one month each to Berlin. Here they will have time to work on the presentation of their research results. The candidates will work parallel to each other in different project spaces, where they have the opportunity to develop experimental exhibition formats for their artistic research processes. Matches will be made according to the content of the different research projects and the program of the exhibition spaces. The relationship of art and research is a topic of increasing public interest, as numerous conferences, exhibitions and courses of lectures taking place these past years show. It is evidence of a discursive shift away from the creative process’ and towards ‚artistic research’. This becomes particularly clear at European art schools. In the context of the Bologna reform a 3rd educational cycle is developing, opening postgraduate training to art students. New approaches, such as the practice based PhD, opens the possibility for artists to undertake research within university. While Great Britain has been offering such programs for approx. 20 years, they are increasingly drawing attention in the rest of Europe as well. How to evaluate these programs is being discussed broadly. For most art schools the introduction of the 3rd cycle means a considerable structural re-organization.